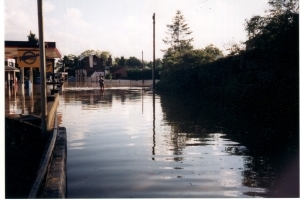 With large areas of the country under increasingly high levels of flood risk, and the problems likely to become worse as a month’s rain is predicted in the next day or so, there is an increasingly loud and widespread call for someone to blame; or for greater accountability, as it might more correctly be described. “We made a mistake, there’s no doubt about that and we perhaps relied too much on the Environment Agency’s advice”. [BBC Website]. The maintenance of rivers and flood defences, nevertheless, does cost money, and there have been some dramatic budget cuts within the EA in the last several years; so, perhaps money has more to do with this issue than meets the eye, with cuts making it more difficult to manage projects that they are already responsible for. Dredged material (silt/mud) needs to be placed somewhere, and, with the EA’s increased focus on wildlife and habitats, this reluctance to dredge may have had some bearing, due to the possible environmental damage it can cause when dredging is extensive, due to habitat loss. “like to attach limpet mines to every pumping station in Somerset”. Words she might find somewhat regrettable in the current circumstances. Whoever is to blame for the floods on the Somerset levels, it seems clear that a policy change and increased communications and accountability may be required in the near future; particularly regarding new construction on, and management of, historic flood plains. However, this is all likely to be too little too late for those already suffering in the aftermath of unheard of water levels, which are set to rise further still.